TO PREPARE THE MUSHROOMS: Trim, wash and drain the assorted mushrooms. Heat the olive oil in a medium sauté pan, add the prepared mushrooms, and sauté for 2 - 3 minutes. over high flame, tossing occasionally. Add the shallots and cook 1 more minute. Add a pinch of garlic and season with salt and pepper. Toss several times and remove from heat. Transfer mushrooms to a plate and keep warm. TO PREPARE THE SAUCE: Place the same sauté pan in which you cooked the mushrooms over high heat. Add the port wine and vinegar. Bring to a boil and reduce by half to obtain about 1/4 cup port wine reduction, approximately 4 minutes. Remove from heat and whisk in the butter. Taste and adjust seasonings. Keep warm. TO PREPARE THE WILD DUCK BREASTS: Lightly salt and pepper the duck breasts. In a large skillet, heat the 2 tablespoons of butter and 1 tablespoon oil. When the butter begins to brown, add the breasts, skin side down. Sauté for 1 - 2 minutes. Then turn the breasts and cook an additional 2 - 3 minutes for medium rare. 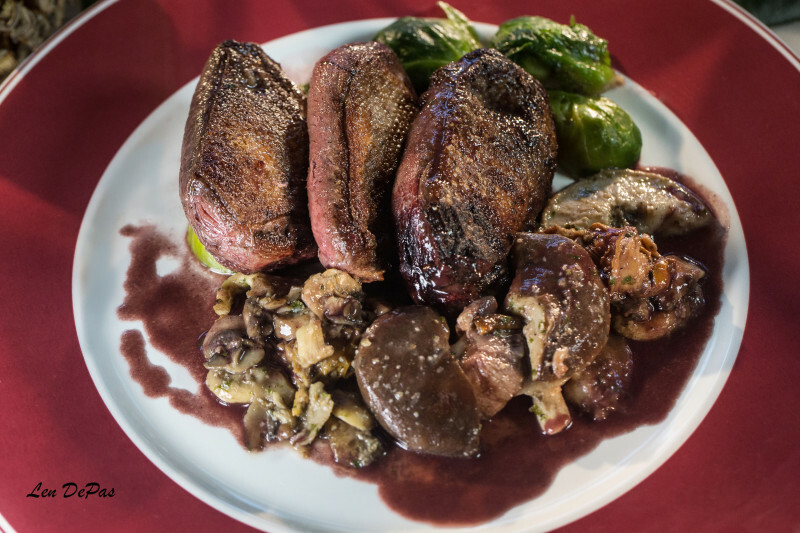 Cooking times will vary depending on the thickness of the duck breasts. Increase the cooking time to suit individual taste. Remove from pan and allow to rest for 5 minutes. TO SERVE: Warm four plates in a 200 degree oven. 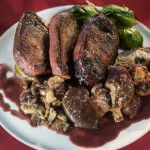 Place one prepared duck breast and a serving of mushrooms on each plate. Pour sauce around breast and mushrooms and serve. HINT: Breasts may be grilled. Mix several varieties of mushrooms. Sauté mushrooms over very high heat. If necessary, prepare in several batches, as the mushrooms will boil rather than sauté if overcrowded in the pan.